THE winner of last weeks give away is Linda Brown. Please contact me with your address so I can send you your thread and fabric. Congratulations. 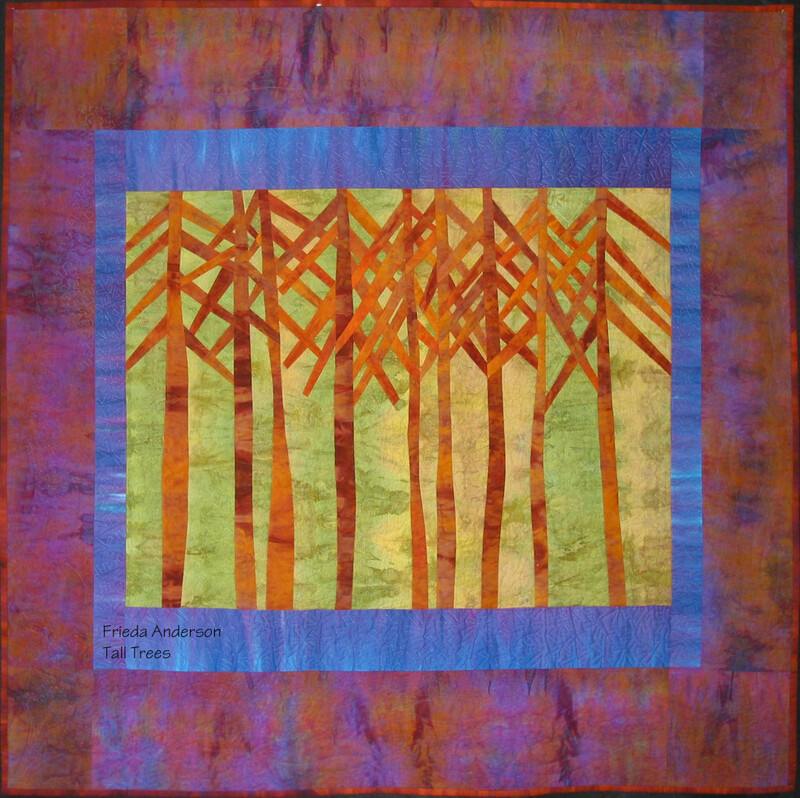 I have been fusing my art quilts for more than 20 years. BUT, I also make pieced quilts. I have a hankering for making more pieced quilts lately. Here are just a few of my quilts that are pieced. this quilt is owned by Del Thomas and resides in her collection. 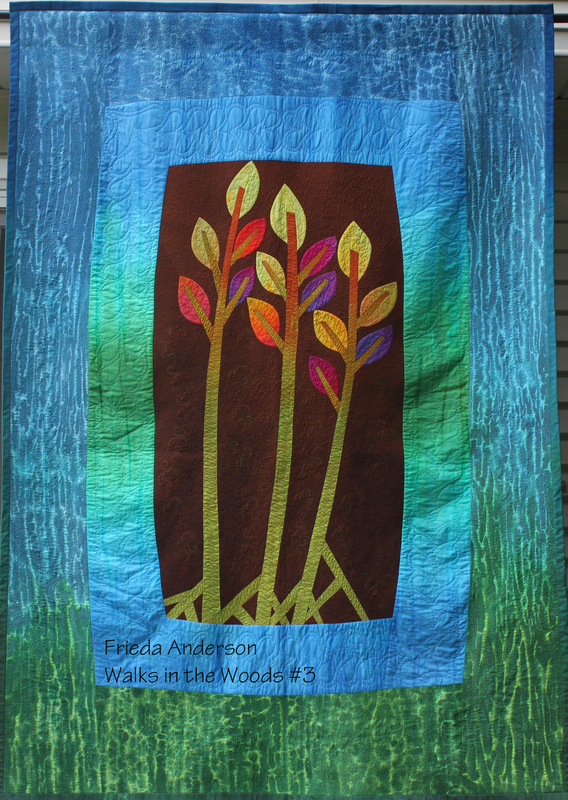 You can see a blog post she did about this quilt last year at the link. A few quilts from the past that are pieced. I hope you will tell me what you think. This quilt was a transition quilt for me. 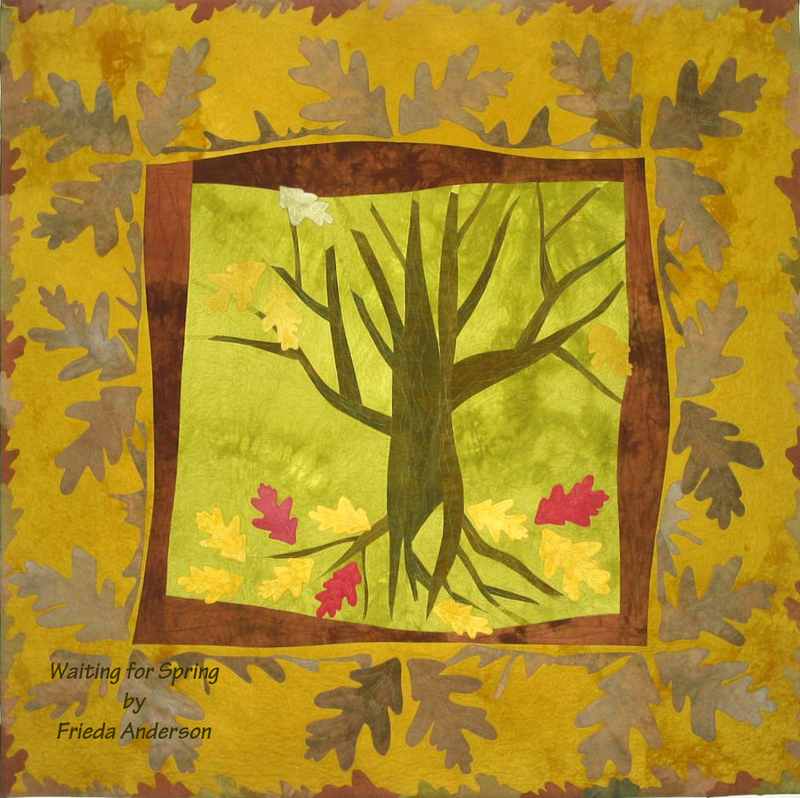 The center section is free form pieced and then all of the oak leaves are fused as is the fused oak leaf border. 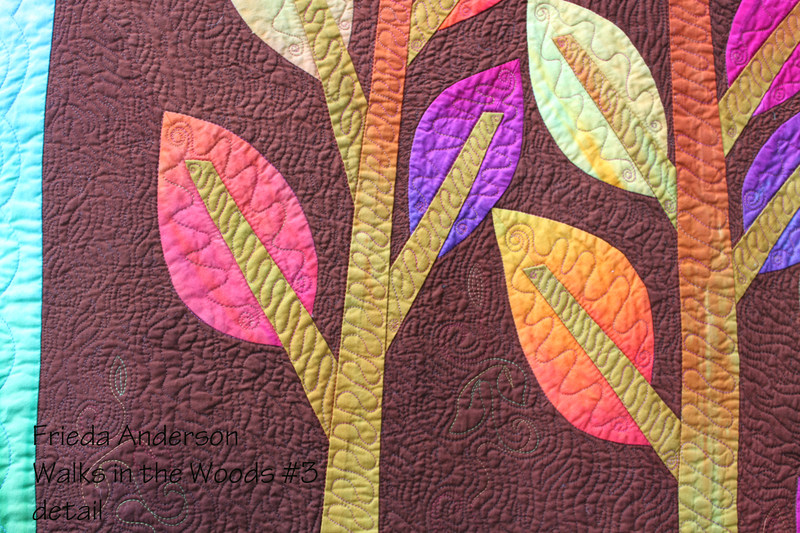 This quilt was inspired by a smaller fused quilt that I JUST loved. I translated it into this much larger work – 54″ x 54″. The trees are all pieced using a fold and sew freezer paper technique I developed. 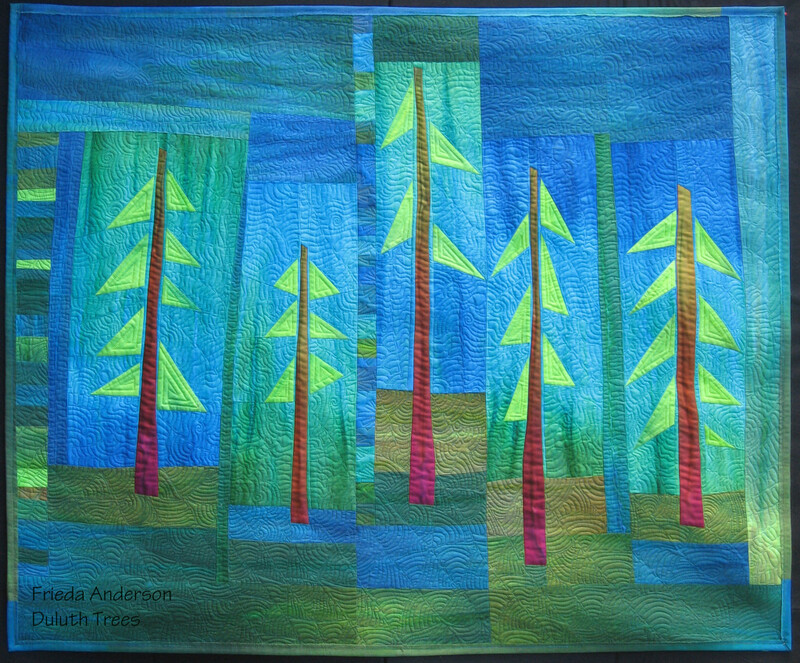 Duluth Trees was also inspired by a fused quilt. I felt the need to piece it as well. Another quilt inspired by a fused design. 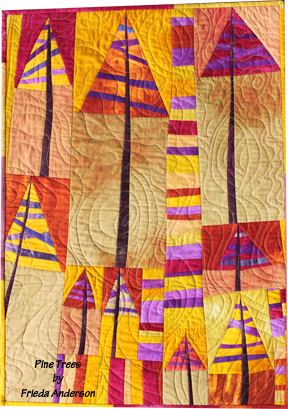 This one was inspired by my pattern SunSet Pines. 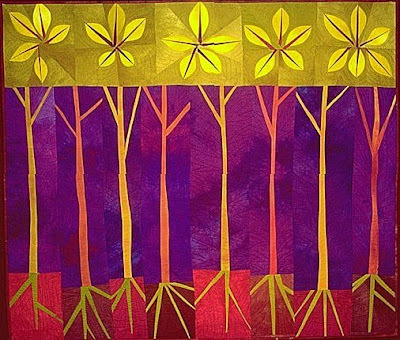 Hope you have a happy day quilting. I am on my way to Paducah KY. Laura and I will be setting up our booth to sell our hand dyed fabrics, threads and patterns. I have been dying lots of silk and cotton for the booth. I hope you are able to attend this year. Look for us at the back of the main hall in booth #1224 (think Christmas Eve). See you there!! Love ‘Tall Trees’ and ‘Duluth Trees’! I’ve had in mind to make a pieced quilt similar to these but haven’t yet figured out how to go about it, or haven’t gotten to it yet. Great work! I think your pieced quilts are lovely!! On the way to old Paducah, to attend the quilt show there….